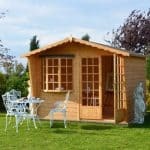 This summerhouse has real WOW factor and is the ultimate in luxury. 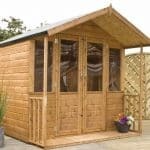 Ideal for large garden spaces or perfect as an extension to your own home this really is spectacular. 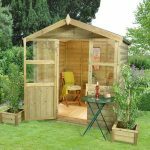 A huge summerhouse with quality features and constructed from excellent long lasting and hard wearing wood with log thickness of 35mm or 44mm. 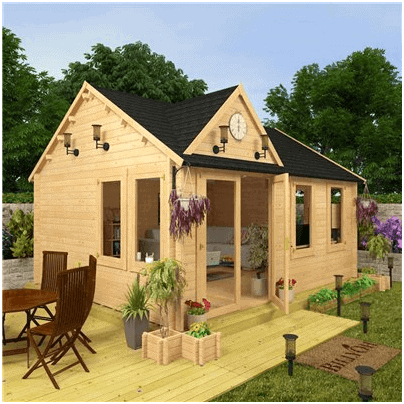 The tongue & groove cladding is extra thick – this will last you a lifetime. 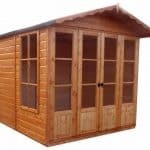 Complete with stunning features such as an exterior clock, outdoor lighting, double doors and windows (both fully glazed and functional) it is the crème de la crème of outbuildings. 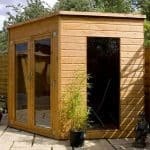 You really won’t want to leave it and there is plenty of inside space for you to customise and furnish as you please, it is an extension to modern living, for whatever purpose you choose to use it for, you will be over the moon.